Sunday August 30th 1903 I got my wash done up and a nice dinner Otts family and Mother wee out. It was so cold we sat in the kitchen most of the day. Walter came back to do his chores and I rode down to Woolf to spend the evening while he went to church. Monday August 31st 1903 I had churning to do but sewed a little before noon. I went down home in the afternoon and in to the depot for the 5 oclock train. Will got home. I got supper and we talked in the evening. I am having an extra hard time with my head hurting me. Tuesday September 1st 1903 Walter took his things away as he is obliged to go home. Will went to the pasture in the forenoon. \i was busy sewing what spare time I had. 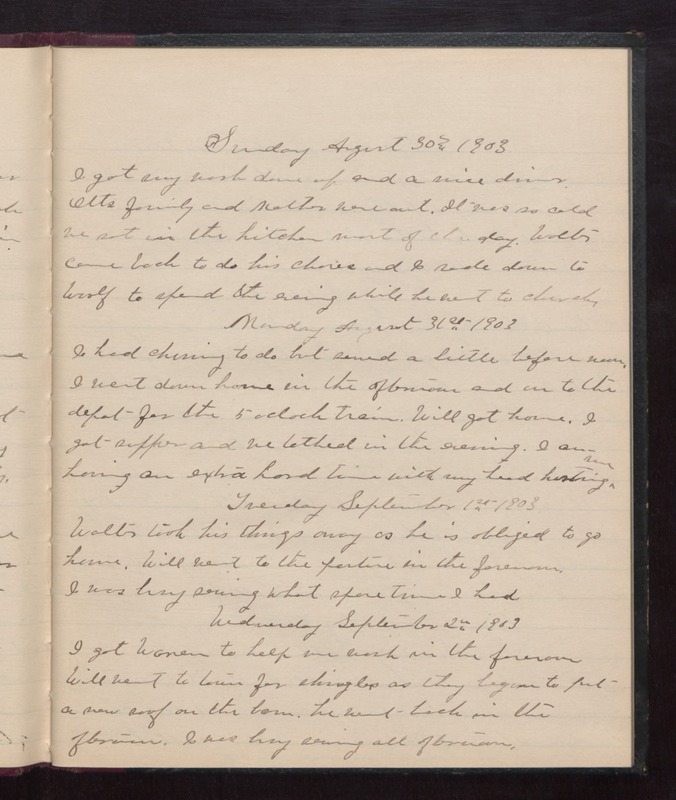 Wednesday September 2nd 1903 I got Warren to help me wash in the forenoon Will went to town for shingles as they began to put a new roof on the barn. He went back in the afternoon. I was busy sewing all afternoon.